James Cagney. Humphrey Bogart. Pat O'brien. Thriller. Classics. 01 Kelly's Heroes. Hearing Impaired (DVD). Gangster/Mob. Drama. Film Noir. Recommended. 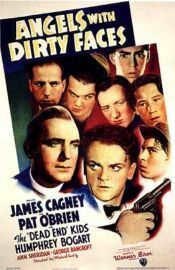 A gutsy 30s gangster noir with two 'hood boys whose paths into adulthood are a complete contrast; Cagney becoming a violent gangster and O'Brien a priest. O'Brien has to fight the local kids' hero-worship of Cagney, and this leads to an emotional and ambiguous climax. Tense, dramatic, well-acted with sharp dialogue. Astounding.